Liverpool 4, Drum Set from Ludwig Drums. 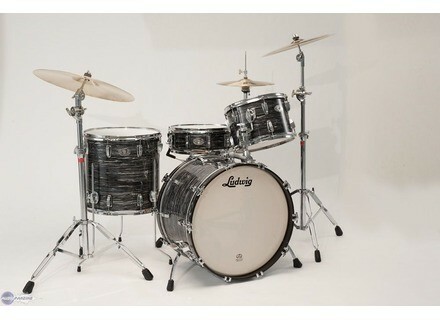 In the spirit of the original "Ringo Kit", Ludwig has presented the Liverpool 4 in Original Black Oyster Pearl finish. The Liverpool 4 hosts the configuration and 3-ply shell "heard most on the timeless recordings of yesterday", according to Ludwig, and is the first Legacy kit to feature standard-sized Classic lugs along with a new Rail Consolette tom mount. The first 100 sets will feature Ludwig's 100th Anniversary badge on each drum. MSRP on the drums is $4285, stands not included. Check out www.ludwig-drums.com for more info. Roland TD-4S Shipping Roland has announced that the TD-4S V-Drums Kit is now available. Ludwig Drums Epic Series Ludwig's new Epic Series features thin 6-ply shell. Taye Drums RockPro Brushed Midnight Blue Finish The RockPro is described as "combining all the pro features with student pricing."